To coincide with Fashion Revolution Week & The judging of our #makemeeintosomethingnew Refashion Challenge. Make Mee Studio are holding a community repair workshop at Lewisham Village. You can bring along anything you’d like to mend, update and upcycle and our experts will be on hand to teach you the skills to repair it yourself. Have the moths made a meal of your favourite jumper? Or are your jeans coming undone at the seams? Have you got an ill fitting dress in the back of the wardrobe you can’t bear to part with? You’re not alone. Are you a Hoarder or a Thrower? 23% of the clothes in our wardrobes are going unworn. Some people throw them away but over 300,000 tonnes of clothes go into Landfill every year, and 95% of that could be reused or recycled! There’s no need to get rid come and learn how to mend your clothing with Make Mee Studio. All ages and abilities welcome. A lot of effort goes into making clothing and we think they should be loved, cherished and given a second chance and want everyone to have the skills to be able to save clothing from landfill. When you can sew you have great power in being able to unlock the potential in broken, forgotten, ill fitting items and turn them in to something new and keep them in use for longer. It’s heartbreaking when you think about the time, energy and resources that go into making our clothes and the people in the supply chain that make them, and we just throw them in the bin! We’re coinciding this workshop with Fashion Revolution Week which falls on the anniversary of the Rana Plaza factory collapse, which killed 1138 people and injured many more on 24th April 2013. During this week consumers ask brands #whomademyclothes to encourage transparency in the fashion industry. Fashion Revolution aims to radically change the way our clothes are sourced, produced and consumed, so that our clothing is made in a safe, clean and fair way. Making your own and refashioning is a message to brands that we don’t just need to buy endless amounts of new clothing to be fashionable, we can take power in to our own hands! You can even join in with our Refashion Challenge making something new from something old and you could be in the line for a prize. We’re there for 4 hours and you can drop in at anytime and stay as long as you like and space permitting. Space will be a little limited. Come early or if you want to pre-book a time slot to let us know when you’re coming book below, and you will get priority at that time. There will be sewing machines as well as a fun printing activity, great for children, bring along an old t-shirt to update it! Refashion Challenge winners announced & kids catwalk from 4pm. 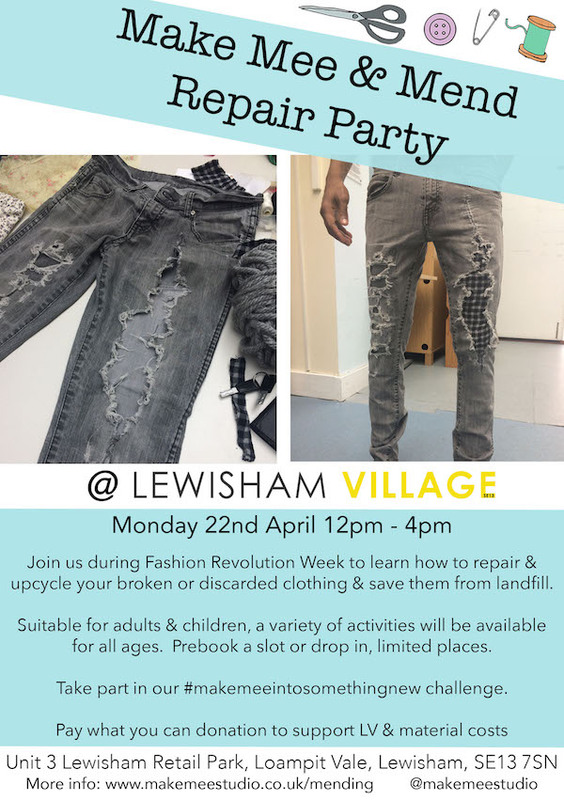 Lewisham Village have all kind of Fashion Revolution events on all week so be sure to check them out.